Quontica and Marlando Sparks first testified about education in Washington state this past April, when they spoke about the impact of school discipline on families they worked with. But their involvement in education advocacy started much earlier. For Quontica, it began when she was still a child. She was raised by her grandmother, who worked fulltime, along with a number of cousins. As the eldest grandchild, Quontica says she took on a role of caring of her brother and cousins, helping them with school, and even going to school conferences when her grandmother was not available. Quontica learned her way around the school system in order to advocate for her brother, cousins—and herself. Quontica and Marlando have both worked for their school district, so they are familiar with the way the public school system works. Quontica says that they were two of a handful of African American staff members in the district and many parents in the community approached them for help and advice in navigating the system. 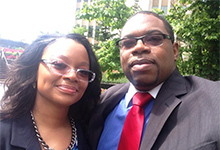 Through word of mouth, Quontica and Marlando became the de facto experts in their community on parental rights and advocacy within the public education system. LEV Community Organizer Micaela Razo learned of their work in the community and approached them to testify about school discipline to the Office of the Superintendent of Public Instruction (OSPI). They also testified this summer about the College and Career Ready Diploma. Quontica and Marlando plan to provide wraparound services for families and their children from preschool through high school, with every graduating student completing high school prepared for college. They have applied to the Washington State Charter Schools Association’s Leadership Center and will learn mid-October if they have been selected for a fellowship. Regardless of what the future holds for Quontica and Marlando, you can rest assured that they will be engaging with, and advocating for, parents and youth throughout their community—and throughout the state.